In the field of tissue culture, there is a rapidly growing need for systems capable of creating precise, reproducible and physiologically relevant cell environments deemed vital for accurate analysis of cellular processes with respect to function and metabolism. In order to accurately reproduce physiological conditions in cell-based research, a ‘contamination-free’ workstation offering precise and continuous control of oxygen, carbon dioxide gas, temperature and humidity is required. Rising to this challenge, Oxford Optronix has developed the HypoxyLab™ - a unique, fully-featured, ergonomically engineered and easy to use hypoxic workstation that provides a highly stabilised HEPA-filtered environment in which levels of oxygen, carbon dioxide, temperature and humidity are all precisely controlled. 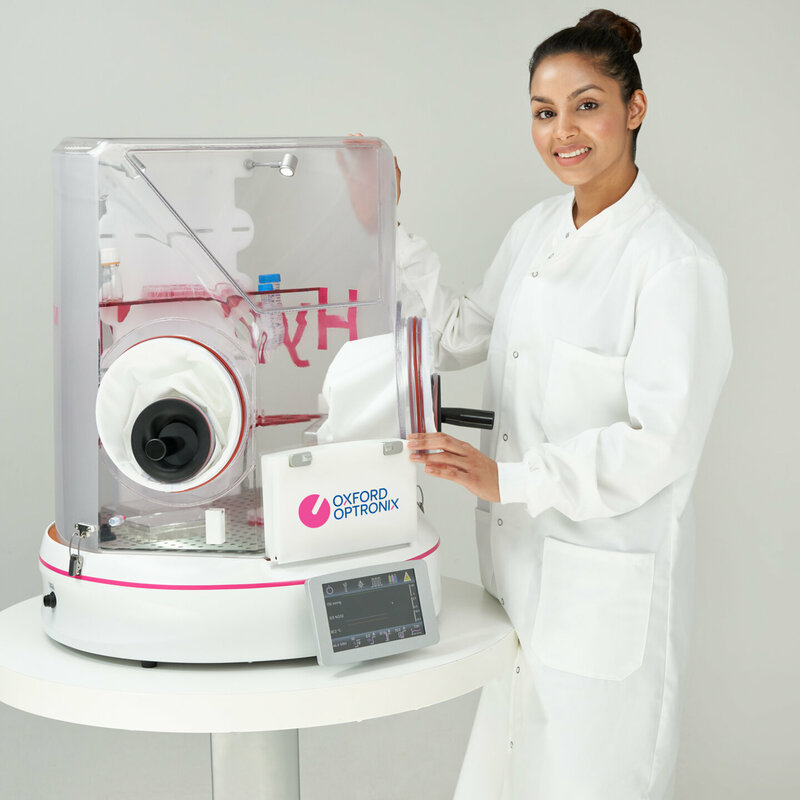 In short, HypoxyLab™ is a compact hypoxia workstation and incubator for everyday use. As every scientist knows, it’s the partial pressure of oxygen that reflects the oxygen that cells actually ‘see’. The partial pressure of oxygen varies not only with oxygen concentration in the atmosphere, but also with altitude and prevailing weather conditions. We believe it is simply implausible to express hypoxia in terms of a (barometrically uncompensated) percent oxygen concentration value alone. HypoxyLab is the world’s first and only hypoxia chamber that directly regulates its environment using the partial pressure of oxygen, expressed in units of mmHg or kPa, and is thereby insensitive to changing climatic and altitude conditions. This scientifically rigorous approach enhances HypoxyLab's accuracy over other devices that rely simply on barometrically uncompensated % oxygen measurements. This provides researchers with scientific certainty and the ability to replicate ‘real-life’ hypoxia in vitro at the highest level of accuracy achievable. HypoxyLab creates a fully humidified, stable hypoxia environment (pO2 of 10 mmHg) in less than 20 minutes from switch-on and can deliver stable, near-anoxia conditions (pO2 of 1-2 mmHg) in under an hour, all while consuming suprisingly little nitrogen gas. HypoxyLab provides the option to measure oxygen availability in the microenvironment where cells are actually growing, thereby revealing the oxygen gradient between the chamber environment and the cell layer. HypoxyLab achieves this by providing a connection within the chamber to attach an OxyLite™ oxygen sensor. Considered the ‘gold standard’ for biological and physiological applications, the OxyLite sensor is a tiny, highly accurate, non oxygen consuming sensor that can be accurately positioned anywhere within the cell culture to obtain continuous dissolved oxygen measurements. We have teamed with Lonza Cologne GmbH to offer the CytoSMART™ System, an extremely compact digital microscope solution that can be deployed within the HypoxyLab and is built to withstand long-term exposure to tissue culture environments. The system is supplied with an accompanying tablet, which is kept outside the HypoxyLab and on which live cell culture images are displayed. The CytoSMART™ system supports time-lapse recording and cloud-based access to images and time-lapse data from any browser-capable computer, smartphone or tablet device. HypoxyLab includes a built-in (and replaceable) HEPA filtration system that continuously scrubs the chamber atmosphere. This is capable of achieving an atmosphere equivalent to, or better than ISO 14644-1 Class 2 within 30 seconds of power-up, ensuring that cultures and media are protected from the risk of contamination. Internal humidification within the chamber is delivered using an ultrasound nebulizer rather than just a pan of water, reducing another potential source of contamination. Set point values of the partial pressure of oxygen (pO2) as well as chamber CO2, temperature and humidity are controlled via HypoxyLab’s touch-screen display and delivered using digital gas flow controllers and state-of-the-art sensors. HypoxyLab is the most faithfully accurate system available today, capable of controlling the partial pressure of oxygen with an accuracy of up to +/- 1 mmHg. HypoxyLab’s integrated full colour touch-screen provides convenient control over all instrument settings whilst simultaneously displaying real-time data in both digital and graphical format. The display updates the user with vital information such as actual and set-point values for gas composition, humidity and temperature and provides access to useful features such as the oxygen profiling feature. All HypoxyLab parameters are continuously recorded onto internal flash memory and can be exported to a USB flash drive via a port at the rear of the HypoxyLab at any time. Data files can be analyzed and played back retrospectively using the free LabChart® Reader by ADInstruments. HypoxyLab’s Easy-Entry hatch system affords quick and convenient transfer of cells, culture-ware and media into the chamber without the need for complicated air locks and isolation hatches. As soon as items are passed through the hatch, HypoxyLab immediately applies the precise gas composition necessary to maintain steady-state conditions. This immediate response effectively eliminates fluctuations in the pO2 of cell media during operation of the Easy-Entry system. An internal ‘letterbox’ style flap acts as an additional barrier against gas displacement when the hatch is opened. HypoxyLab’s lightweight and durable cover means that it can be easily removed by just one person. This not only allows for easy loading of media and consumables but makes routine cleaning and disinfecting of the workstation a practical reality. HypoxyLab’s patented ergonomic design ensures natural, relaxed operation. The angled vision panel combined with adjustable LED illumination provide excellent visibility. Choose between bare-hand or gloved operation using HypoxyLab’s easy-to-use cuff and sleeve system. HypoxyLab also includes height-adjustable shelves and a USB power socket within the chamber for powering accessories such as microscopes and micro-centrifuges. HypoxyLab’s intuitive graphical user interface gives researchers the ability to automatically cycle through up to eight oxygen profiles. The fact that HypoxyLab can adjust the hypoxia equilibrium in a matter of minutes (rather than hours) adds real value to the concept of ‘oxygen profiling’ whilst maintaining minimal levels of gas consumption. HypoxyLab’s highly considered design minimises dead-space, ensures rapid equilibration to set points and frugal gas consumption. Service-free sensors and a user changeable HEPA filter simplify routine maintenance and minimize HypoxyLab’s true cost of ownership. Cells react in different ways both metabolically and morphologically depending on the environmental factors maintaining and interacting with them. In tissue culture, faithfully reproducing the in vivo cell environment is vital for accurate analysis of both cell metabolism and cell function. It is commonly accepted that cells in vivo experience oxygen concentrations in the range of 5 – 80 mmHg (approx. 0.5 – 10% oxygen), depending on the tissue type. Yet the vast majority of cell biology research is still performed in incubators in which cells are exposed to atmospheric oxygen levels (circa 21%), officially a 'hyperoxic' state for most cell types. In other words, the oxygen concentration typically encountered by cells in traditional incubators is at least twice that expected in normal tissues. Exposing cells to unnaturally rich oxygen environments (even for a short time) can have profound implications on cell metabolism and signalling pathways. For instance, the hypoxia-inducible factor (HIF) pathways nicely illustrate the potential for specific oxygen tensions to dramatically affect intra-cellular metabolism. By delivering a contamination-free environment that offers precise and continuous control of oxygen, as well as of CO2, temperature and humidity, HypoxyLab delivers a powerful new solution to research and industry looking to reproduce representative physiological conditions in cell-based research. Meanwhile, it is the partial pressure of oxygen, not merely the % oxygen concentration that cells in culture actually ‘see’. HypoxyLab adopts this fundamental scientific principle and controls the chamber environment using the partial pressure of oxygen (pO2) expressed directly in SI units of mmHg or kPa. Since the partial pressure of oxygen varies not only with oxygen concentration but also with altitude and prevailing atmospheric pressure, this scientifically more rigorous approach substantially enhances HypoxyLab’s performance accuracy relative to other hypoxia chambers and workstations that rely on % oxygen concentration control alone. The HypoxyLab™ features an integrated full colour touch-screen display on which real-time data are displayed in both digital or graphical format and that provides full control over all gas, temperature and humidity set-points. The user interface also offers a programmable oxygen profile function and access to an array of system settings via a control panel. Proteomic Analysis of Human Macrophage Polarization Under a Low Oxygen Environment (2019). Court M, Malier M and Millet A. J. Vis. Exp. Induction and Assessment of Hypoxia in Glioblastoma Cells In Vitro (2018). Gagner JP, Lechpammer M and Zagzag D. Methods Mol Biol. HypoxyLab is a cell culture incubator and hands-on workstation that accurately mimics and maintains true physiological oxygen conditions, as well as maintaining temperature, humidity and CO2 conditions like any standard cell culture incubator. How does HypoxyLab™ differ from other hypoxia workstations? The HypoxyLab is highly compact, can fit on an ordinary lab bench, does not require the use of a transfer hatch, features built-in HEPA filtration, active humidification and regulates its oxygen environment using the absolute partial pressure of oxygen for maximum precision. Why mmHg instead of % oxygen? Using the partial pressure of oxygen to control the oxygen environment within HypoxyLab is simply the more scientifically accurate thing to do! Since atmospheric (barometric) pressure changes with weather patterns (as well as with altitude), so does the oxygen concentration if it is merely maintained as a percentage thereof. Instead, HypoxyLab uses the partial pressure of oxygen to compensate for barometric pressure fluctuations (or differences in laboratory altitude), ensuring that cells in culture 'experience' a consistent oxygen concentration. How do I get items in and out of the system? Cell culture plates, medium, pipettors and other objects can be moved in an out of the HypoxyLab via the simple to operate easy-entry hatch at the front, or can be placed into the chamber prior to the start of the experiment by simply lifting off the whole enclosure cover. Does external air enter the HypoxyLab™ when I open the easy-entry hatch? The HypoxyLab strictly minimizes the ingress of external air by detecting the opening of the hatch and transiently generating a slight over-pressure. Some external air will enter the chamber but the system is so quick to correct for any atmospheric oxygen ingress that there can be no adverse effect on cell cultures being maintained. Do I have to wear gloves to operate HypoxyLab? There is no requirement per se for the operator to wear gloves, however, as with all cell culture work, wearing gloves represents good laboratory practice. How can I clean the HypoxyLab™? The HypoxyLab can be easily cleaned/disinfected (using 70% ethanol or hydrogen peroxide based surface cleaners) by removing the enclosure cover to expose all internal parts. The enclosure cover can be easily and quickly removed by one person. What gases are required to operate HypoxyLab™? 3 gases are required, namely: synthetic air (20% oxygen balanced in nitrogen), 100% CO2 and 100% nitrogen. All gases should be of typical laboratory grade purity (we suggest 'zero grade' 99.998% ('N4.8') or better) and be supplied at between 1 - 4 bar (15 - 60 PSI) pressure for synthetic air and CO2, and at between 3 - 5 bar (45 - 75 PSI) pressure for nitrogen. Is the user protected from substances inside the HypoxyLab™? No, while the HypoxyLab features a built-in HEPA filter that continuously ‘scrubs’ the internal atmosphere, the system does vent externally. The HypoxyLab is NOT therefore a substitute for a fume cupboard or a biological safety cabinet. How clean is the internal environment? The built-in HEPA filtration system achieves an atmosphere equivalent to, or better than, ISO 14644-1 Class 2 within 30 seconds of power-up, ensuring that cultures and media are protected from the risk of contamination. Can I measure dissolved oxygen levels directly from within my cell cultures? Yes, the HypoxyLab features a dedicated internal connector that supports a fibre-optic dissolved oxygen sensor capable of reading absolute dissolved oxygen in units of mmHg directly from media or cell culture dishes. An optional hardware add-on and our OxyLite™ oxygen monitor are required in support of this functionality. Does the user need to be standing to operate the HypoxyLab™? The system can be operated standing up or from a seated position. A height-adjustable stool is recommended for seated operation. What is the typical nitrogen consumption rate of the HypoxyLab™? Nitrogen is used both to generate and maintain an internal hypoxic environment and to generate the temporary over-pressure when the easy-entry hatch is operated. Of the 3 required gases nitrogen is therefore consumed the quickest. While usage rates will be extremely dependent on the conditions being maintained and the usage ‘profile’, we estimate that a large (50L water volume) bottle of compressed nitrogen will last approximately 1 week with typical daily use of the system. Do I have access to the trace data displayed on the touch-screen? Yes, data are automatically and continuously stored to internal memory and can be copied to an external USB media at any time. The internal memory is sufficient for approx. 2 weeks of continuous recordings, at which point old data files are progressively overwritten. Data are written in a format that can be read by the free LabChart Reader software, by ADInstruments. Considered the ‘gold standard’ for biological and physiological applications, the OxyLite™ oxygen monitor supports highly accurate measurements of dissolved oxygen from within cell cultures, medium etc. via miniature, fibre-optic sensors and a dedicated connector positioned inside the HypoxyLab™. Technical specifications for OxyLite can be found here. The CytoSMART Lux 2 is a compact inverted microscope for bright-field live cell imaging in situ, inside the HypoxyLab. The system operates at low voltage and is thus safe to use within the HypoxyLab (as well as regular CO2 incubators). Power comes from a USB port conveniently positioned within the HypoxyLab. Supports single images (jpg files), time-lapse videos (avi files) and confluency data (csv files), with optional cloud storage for access from any PC or mobile device. A purpose-designed, stretchy thermal jacket is now available for HypoxyLab, which allows the maintenance of higher internal humidity for reduced evaporation from cell cultures, while benefiting overall power consumption too. This optional, sturdily-built and electrically height-adjustable worktable is a perfect, ergonomic companion to the HypoxyLab as it offers both good clearance for legs and knees beneath and can be adjusted to any preferred seated or standing height at the touch of a button. The worktable is supplied on lockable, heavy-duty coasters allowing the HypoxyLab to be easily repositioned around the lab or temporarily stored, freeing up valuable lab space. Compressed CO2 with inlet connection standard BS8 (UK) or DIN6 (EU) or CGA320 (US).